Save at least $175 on what it would cost to buy the different parts of the package separately! This fabulous ticket combines 3 days of pure fun and excitement including extensive double decker touring, a delightful Hop-on, Hop-off Ferry, a close look at the Statue of Liberty, Choice of admission to Empire State Building Observatory OR Top of the Rock Observation Deck and other thrilling attractions. And it's incredible value! You'll save at least $175 on what you would spend if you purchased all the components separately. No fewer than 72 hrs of sightseeing on four Hop-On, Hop-Off bus routes are included in this package. You can also see the city sparkle at night on an escorted Night Tour and discover its charm on a free sightseeing ferry. You will also get a free Statue of Liberty and Ellis Island ferry ticket. Frequent departures mean that your valuable New York sightseeing time will not be wasted waiting for the next bus. While on the bus, an English-speaking official New York tour guide will ensure you don’t miss a thing. Recorded commentary in choice of 11 languages is also included. The recorded tour content and narration is enhanced with music and sound effects, mimicking the street sounds of NYC. Ticket is valid for 72 hours from the time the ticket is issued. 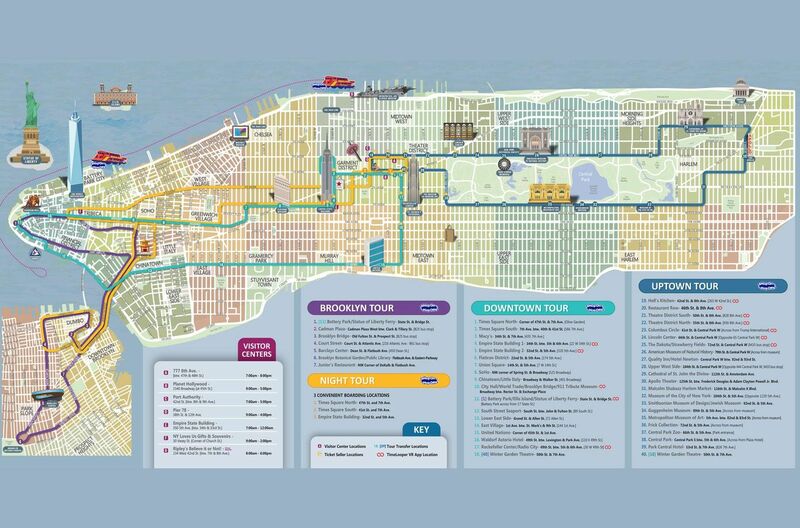 Explore at your own pace with the New York hop-on, hop-off tour on 4 different routes. Take a guided tour of New York by night. Take a Hop-on, Hop-off Ferry and visit the Museum of the City of New York or New York Historical Society Museum. You can enjoy live commentary in English on double-decker buses or recorded commentary in choice of 11 languages; English, French, Spanish, German, Italian, Portuguese, Mandarin, Russian, Japanese, Korean or Hebrew. Statue of Liberty and Ellis Island Ferry Ticket: The magnificent Statue of Liberty was a gift from France to the United States for the 100th anniversary of America’s independence. Boats to Liberty depart at regular intervals from Battery Park (Whitehall Street between Bridge & Pearl Sts. Stop #14 on downtown Tour bus). The first boat departs at 9.30am. You can choose between the Top of the Rock Observation Deck or the Empire State Building Observatory at the NY visitor centre when exchanging your voucher for tickets. Empire State Building Observatory: It is currently the 9th tallest building in the world and the 4th tallest freestanding structure in the America. This NY monument has 102 stories, and was the first building to every have more than 100 stories. Top of the Rock Observatory Deck: Discover Top of the Rock Observation Deck and experience breath-taking views of New York City. Step on one of their glass ceiling sky shuttles for a thrilling ride to the Top, where you will find three stories of spectacular views, including a stunning, open air, 360-degree panorama from the 70th Floor outdoor deck. Optional VIP Pass: Be a real VIP with Gray Line CitySightseeing New York VIP all access pass! This pass allows priority boarding at all stops on the double-decker buses and CitySightseeing New York Cruises. There will be a separate line for boarding which could also be at the front of the bus. That’s not all! You will also enjoy a variety of discounts and special privileges including restaurants and retails stores. Also, included is an insert identifying all stops and discounts. You will be able to choose between the Top of the Rock observation deck or the Empire State Building observation deck at theGray Line CitySightseeing New York Visitor Centre when exchanging your voucher for the tickets. Please be sure to check in at least 30 minutes prior to anticipated departure at the Gray Line CitySightseeing New York Visitor Centre. Great way to get around a new city & the local guides brought a humorous insight. It was a little confusing until you actually go to use the tickets. suggerimento: sarebbe utile avere anche la spiegazione in Italiano nel Tour notturno.